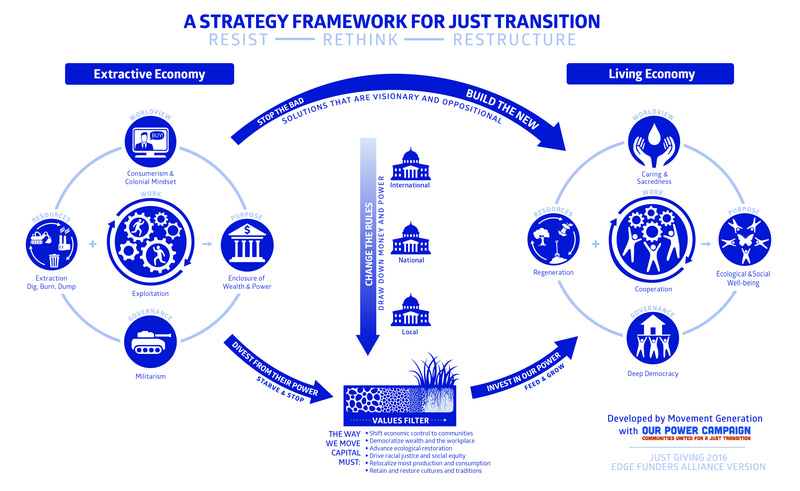 Just Transition means a fair and equitable shift to a Regenerative Economy -- an economy that is in alignment with what the earth can regenerate and that ensured equity, dignity and justice for all. As Alaskans we are at a critical time, an economy dependent on oil and gas development has caused a sharp and severe decline in the State's budget. In addition, we are feeling the very real effects of climate change due to the continuous extraction and burning of fossil fuels. The time is now to transition to a regenerative economy. Indigenous knowledge and worldview is key to this transition. We are working closely with partners throughout the state to both REDEFINE what “economy” is and BUILD just and equitable solutions forward. In the summer of 2017 we hosted a community solar build and together we built a mobile solar unit to power community events and our office. Thanks to our partners at Native Renewables and the Fairbanks Climate Action Coalition! Native Movement is working in partnership with various local and state-wide organizations, groups, and individuals to build solutions. Currently, in the interior we are working in collaboration with the North Star Borough, NAACP Fairbanks, and the Fairbanks Climate Action Coalition to implement 1MW of solar power throughout the borough on low-income residents, non-profit organizations, and school buildings. We are working to uplift and highlight just and equitable transitions all over the state… more to come soon! Download Movement Generation’s Just Transition Zine. This is a great booklet outlining the history and a framework for visioning our work and movement forward. Just Transition Framework visual, another Movement Generation resource. The Indigenous Environmental Network outlines Just Transition and offers resources. Black Mesa Water Coalition outline a Restorative Economy.